A much-anticipated extension to the Inspire Bible line, this beautiful resource is for people wanting to connect to Scripture through art but who have a hard time reading the smaller text in other wide-margin Bibles, or who prefer a larger canvas for coloring and adding original art. 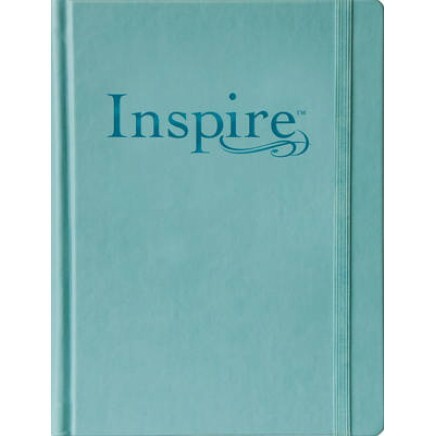 The large-print Inspire Bible offers even more space for notes and illustrations in the extra-wide margins, along with a large, readable 10.8-point text font. The large-print version is the same as the original Inspire Bible, but it augments the beauty of the features with even bigger line-art illustrations to color and ample blank space for creating. Now available in a beautiful, tranquil blue Hardcover LeatherLike edition featuring the much-loved full-color vintage floral page edge printing, a matching ribbon marker, and an elastic band closure.